This is one of the easiest and most delicious recipes for ratatouille you’ll ever come across. The original belongs to Jane Walker, from her book, Creative Cooking with Spices, but I’ve added a few of my own twists along the way. Remove the pith and seeds from the capsicum and chop. Heat the oil in a large saucepan with a lid and cook the onions and garlic until translucent. Add all the vegetables, the coriander seeds, black pepper and the Tabasco (adding more than one drop is obviously fine, to taste). Cover and simmer for 40 minutes, checking and stirring occasionally. As a great vegetarian meal, I serve ratatouille on couscous with a dob of sour cream and a garnish of fresh coriander. It can also be served as a side dish to anything – fish, meat or even pasta. The coriander seeds (numbering a mere 10 in the original recipe) add a distinct flavour to this version of the dish, and its simplicity and seasonality is one of the reasons I like it so much. 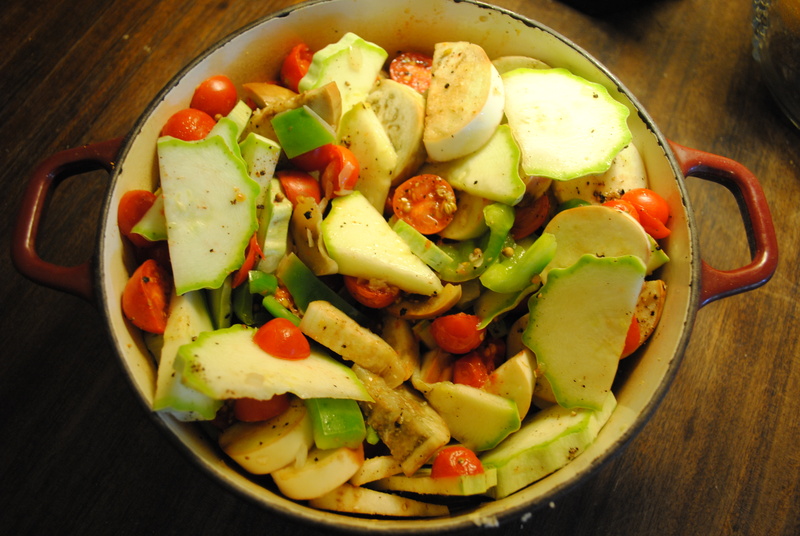 Below is a picture of my ratatouille before it was cooked. I thought it looked so beautiful, I forgot to take a picture of it served up on the plate, and then we ate it, fast. Next time I make it, I’ll take a photo of the final product, but this will have to do for now.